I recently made up this way of doing flower headbands. I think they are super cute and super easy! Next you place the two strands on top of each other and use a baste stitch to sew down the center of the ribbon. Once sewed, pull on of the strings on one end, creating a ruffle. Next tie a knot with the thread in one end. Take the side you just tied a knot in and fold the ribbon so that the fold is along where you sewed your base stitch. Fold one corner over as shown below. While keeping the ribbon folded along the baste stitch, keeping the fold down, wrap the ribbon around its self. After you have wrapped it around at least once, glue onto some felt. I use black or dark brown felt most of the time, unless my ribbon is a light color in which case I usually use white. I use this fabric glue, which works great. After you've glued on the center, let it dry. You can hold it on firmly, but I am lazy so I use a clothes pin to keep it in place. This is an easy project to do in bulk. I do all of the cutting, then do all of the sewing, then as one dries I work on the next. By the time I get back to the first one it's dried and I can move onto the next step. If I do these in bulk I can pump out about 8 in an hour and a half or so. I usually wrap it completely around 1 time and then clothes pin into place and let dry a bit before I go around again. Once it's the size you want, let dry completely. After it has dried, cut the felt around the flower. Once the felt is cut to size, take the loose end and glue under. I use hot glue for this part. Glue onto a headband and then glue on another piece of felt to secure. I use hot glue for this part as well. I can't even count how many compliments I get on these every time Lily wears them. 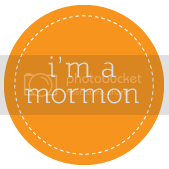 They are SO easy, but I warn you - SO addicting. Above are some of the headbands I made using the technique above. Sometimes I used tiny jewels to accent the center, applied with hot glue. Instead of using 2 strands of 7/8 ribbon just use 1 strand of 1.5 to 2 inch ribbon. 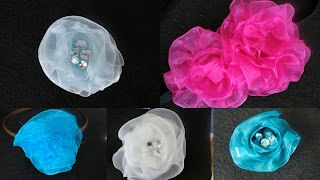 I still love to use organza ribbon for this project. Below are some headbands using this technique. The flower is a little more fluffy, but I love it. This one looks especially cute with jewels in the center. Here are a few headbands and hair ties I did using this technique. 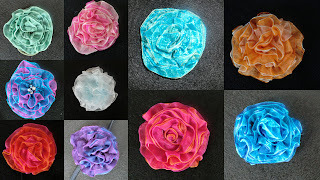 You can enter to win your own Organza Flower Headband here. I am visiting from Wandering Wednesday blog hop. It is nice to "meet" you. I hope you have a great week! These are so pretty! My daughter will have fun making these. How cute are these. You are so clever, thanks for sharing. Thanks for sharing. The flowers are beautiful. Very cute! I like the 2 color organza look! Great job! this week is Tammy from Amber from Lucky Lees To Be. its so beautiful, i can have these flower head bands in as many colors as i want to match each of my dresses, great idea, thanks.. I just found your blog and am your newest follower! 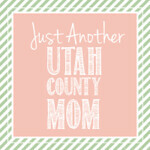 Thanks for creating such a fab blog full of inspiration. I LOVE the headbands too! Oooh! Very pretty. Any little girl would feel like a princess wearing one of those pretty flowers in her hair!